Ticks are blood-feeding parasites of reptiles, birds, mammals and even amphibians (one tick species only). Ticks are generally much larger than other mites; engorged female ticks of some species reach 30 mm in size (Evans, 1992). Ticks transmit more infectious agents than any other blood-feeding arthropods (Hoogstraal, 1985), including Borrelia burgdorgeri (Lyme disease), B. recurrentis (relapsing fever), Babesia spp. (tick fever), and Rickettsia connorii (boutenneuse fever). Other forms of pathogenesis attributed to ticks are anaemia (e.g. Hyalomma asiaticum females consume more than 8 ml of blood per tick; Sonenshine, 1991) as well as dermatosis and paralysis (Roberts and Janovy, 1996). There are approximately 860 spp. in 22 genera and three families (Keirans, 1992; Keirans and Robbins, 1999). The Ixodidae and Argasidae are large and cosmopolitan families, whereas the Nuttalliellidae has one species which has only been found in South Africa and Tanzania (Evans, 1992). The main host of Nuttalliella namaqua is uncertain, as is the life cycle (Oliver, 1989). Most ixodid ticks have three hosts, one for each stage of the life cycle (larvae, nymph and adult), but in some species this has been reduced (one- or two-host ticks spend two or more life cycle stages on the same host individual) (Oliver, 1989). Ixodid ticks need several days to feed, and once the female is engorged she drops from the host to lay eggs (up to many thousand). Argasid ticks only feed intermittently and do not remain attached to their hosts. They may feed many times over their lifetime on a number of different hosts and will often lay only a few hundred eggs. Argasid ticks also have remarkable longevity and have been observed to live for many years and long periods of starvation (Sonenshine, 1991). Haemaphysalis bremneri mouthparts, showing toothed, sawlike hypostome. 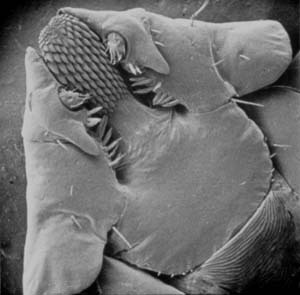 Other prominent features of ticks are their large size, when compared to other mites, and Haller's organ, a complex sensory apparatus on tarsus 1 (the holothyridan mites have a homologous organ). The phylogenetic relationships of the three families of ticks, the Argasidae, Ixodidae and Nuttalliellidae, are unresolved. The monospecific Nuttalliellidae (Nuttalliella namaqua) has morphological features of both the Argasidae and Ixodidae (Keirans et al., 1976), so its relationship to them phylogenetically is unclear. Although molecular analyses of the phylogenetic relationships of the Argasidae and Ixodidae have been done (e.g. Black and Piesman, 1994; Black et al., 1997; Dobson and Barker, 1999), these studies did not include the Nuttalliellidae because few individuals of N. namaqua have ever been found (Roshdy et al., 1983), and they have not been available for molecular applications. Black, W. C., Klompen, J. S. and Keirans, J. E. 1997. Phylogenetic relationships among tick subfamilies (Ixodida: Ixodidae: Argasidae) based on the 18S nuclear rDNA gene. Mol. Phylogenet. Evol., 7:129-44. Black, W. C. and Piesman, J. 1994. Phylogeny of hard- and soft-tick taxa (Acari: Ixodida) based on mitochondrial 16S rDNA sequences. Proc. Natl. Acad. Sci. USA., 91:10034-8. Dobson, S. J. and Barker, S. C. 1999. Phylogeny of the hard ticks (Ixodidae) inferred from 18S rRNA indicates the genus Aponomma is paraphyletic. Mol. Phylogenet. Evol., 11 (2): 288-295. Evans, G. E. O. 1992. Principles of Acarology. CAB International, Wallingford, England. Hoogstraal, H. 1985. Argasid and nuttalliellid ticks as parasites and vectors. Adv. Parasitol., 24:135-238. Keirans, J. E., Clifford, C. M., Hoogstraal, H. and Easton, E. R. 1976. Discovery of Nuttalliella namaqua Bedford (Acarina: Ixodoidea: Nuttalliellidae) in Tanzania and re-description of the female based on scanning electron microscopy. Ann. Entomol. Soc. Am., 69:926-932. Keirans, J. E. 1992. Systematics of the Ixodida (Argasidae, Ixodidae, Nuttalliellidae): An overview and some problems. Pp. 1-21 in B. H. Fivaz, T. N. Petney and I. G. Horak (ed.) Tick Vector Biology: Medical and Veterinary Aspects, Springer Verlag, Berlin. Keirans, J. E. and Robbins, R. G. 1999. A world checklist of genera, subgenera, and species of ticks (Acari: Ixodida) published from 1973-1997. J. Vector Ecol., 24:115-129. Lehtinen, P. T. 1991. Phylogeny and zoogeography of the Holothyrida. Pp101-113 in F. Dusbabek and V. Bukva (ed.) Modern Acarology, SPB Academic Publishing, The Hague. Oliver, J. H. J. 1989. Biology and systematics of ticks (Acari: Ixodida). Ann. Rev. Ecol. Syst., 20:397-430. Roberts, L. S. and Janovy, J. 1996. Foundations of parasitology. WCB Publishers, Dubuque, IA. Roshdy, M. A., Hoogstraal, H., Banaja, A. A. and El Shoura, S. M. 1983. Nuttalliella namaqua (Ixodoidea: Nuttalliellidae): Spiracle structure and surface morphology. Z. Parasitenk., 69:817-821. Sonenshine, D. E. 1991. Biology of ticks. Volume 1. Oxford University Press, New York.